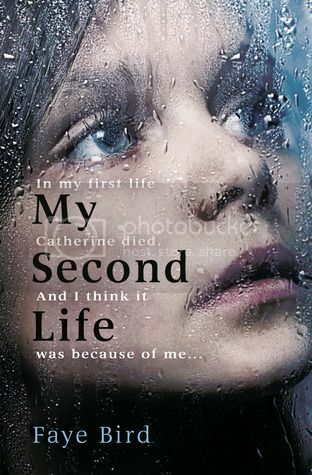 My Second Life by Faye Bird (review copy) - The first time I was born, I was Emma. I was beautiful. I had everything to live for. When I first heard of My Second Life, I was so intrigued! A girl who's lived before! And one who killed someone in her past life! How can you not want to read that? And it was a pretty good story! For as long as she can remember, 15-year-old Ana Ross has known she was once someone else. Once the beautiful Emma Trees. She has memories from that life, but other than missing who she thinks of as her real mum, this hasn't caused her any problems. Until she meets Frances. Seeing the old lady in the hospital triggers memories Ana hasn't had before, and it terrifies her. If she remembers correctly, then Emma – she – killed someone. And not just any someone, but a little girl, one she knew. Catherine. Ana is overwhelmed with the memories and the remembered guilt, but struggles to remember exactly what happened, but she's determined to find out the truth. Of what she did, and why. I was completely gripped throughout the story, turning the pages to find out what would happen. I have to say, there are certain parts of this story that were very predictable. I worked out what happened in the past life very early on. There was a young feel to this story, an almost innocence, that made it clear that this wasn't going to be a very dark and edgy story, so it was obvious that my idea wasn't a theory. It's just there to see. What kept me so gripped was what would happen when she worked this out, what would happen with her and other people involved, and what was motivating certain other people. There was one thing about this story that really got to me. Because she's lived before, and has such strong memories in general about her past life, to her, Emma's mum is her proper mum. And she's just spent the last 15 years without her, with a different woman who she loves, but she just can't think of as her mother. I found that so hard. It made me think of my own Mum, how I would feel if I had to live without her, if there was someone else who wasn't my mother trying to be my mother. That really struck an emotionally chord with me. Yet at the same time, I also found it hard that Rachel, Ana's mother, could feel the distance. How hard must it be to have your child not hug you back every time you embraced them, who shut you out and kept you at a distance, who never called you "Mum" - and not have this as a rebellious teenage phase, but this being your whole experience of being a mother. This is the way Ana has been her whole life. I just found the whole situation really upsetting for both of them. The idea of second lives is something that really intrigues me, so I was really looking forward to that aspect of the story. However, the main focus of the story is simply finding out what Ana did as Emma to Catherine. The fact that Ana has lived before is accepted as fact, and that's it. There's no looking into how or why, if there's anyone else who has lived another life. She just has. In a way, it could have been an amnesia story; this event happened, but Ana can't remember completely what happened, and she's trying to piece her memories back together and figure things out. I would have preferred more about the how and why of past lives, really, but that's not what this story was. Part of me was expecting a different story, but that doesn't make this story bad. An gripping story that keeps you turning the pages, wondering what Ana will do with the knowledge of what she's done. Thank you to Usborne for the review copy. It was sent to me quite a while back, and I've only just got to reading it. I think it was offered to me. I think your best bet is to ask on Twitter if it would be ok to request a copy, and if so, find out the email address of the publicist to contact, and then put it an official request. I can't say either way if they'll be happy to send out a copy or not. It might be too late, but it's worth asking to see. Unfortunately, I'm not on Twitter...but I'll see if I can track the publicist down. Thank you!